Lavender -- Lavandula angustifolia or Lavandula officinalis -- is a shrub known for its pleasant aroma and bright purple flowers. It is native to the mountainous regions of the Mediterranean, but is now cultivated throughout the world, particularly in the United States, Australia and southern Europe. Used in potpourri, cloth sachets, soaps and shampoos, it is also prepared as a tea, which has traditionally been used for medicinal purposes. Inducing relaxation is a traditional use of lavender tea, primarily because of the soothing aroma. The University of Maryland Medical Center reports that scientific studies suggest that inhaling the scent of lavender may slow nervous system activity, promoting relaxation. This can help with anxiety, insomnia, stress and depression. One small study published in the September 2011 edition of the "Journal of Alternative and Complementary Medicine" found that patients who were treated by inhaling lavender oil experienced significant reduction in stress levels and reduced levels of pain when hypodermic needles were inserted. Preparing lavender tea helps release the oils responsible for the beneficial aroma. Another common traditional use for lavender tea is for digestive issue relief, including nervous stomach and indigestion. Modern studies suggest that this may be a valid use. One study published in the November 1997 edition of the "Journal of Ethnopharmacology" found that the smooth muscle -- in the intestines responsible for moving food through the digestive system -- of rats would relax when lavender oil was applied, indicating that humans may be affected the same way. Another study published in the November 2004 "Life Sciences" journal reported that lavender oils protected against the formation of gastric ulcers in rats and relieved indigestion. A convulsion occurs when a muscle contracts and relaxes rapidly involuntarily, causing the body to shake. A spasm is similar, but it usually results in a muscle staying contracted. Lavender oil has been found to be a benefit in reducing both spasms and convulsions. A study published in the July 2000 "Journal of Ethnopharmacology" found that rats given a small dose of lavender experienced reduced convulsions and spasms, which was thought to be a result of the lavender blocking the calcium channel -- a key part of the muscle contraction process. Lavender tea has other traditional uses, although many of them are not backed by scientific research. Other traditional ailments lavender tea may treat include migraines, colic, loss of appetite, toothache, acne, nausea, vomiting, cancer and even use as a mosquito repellent. 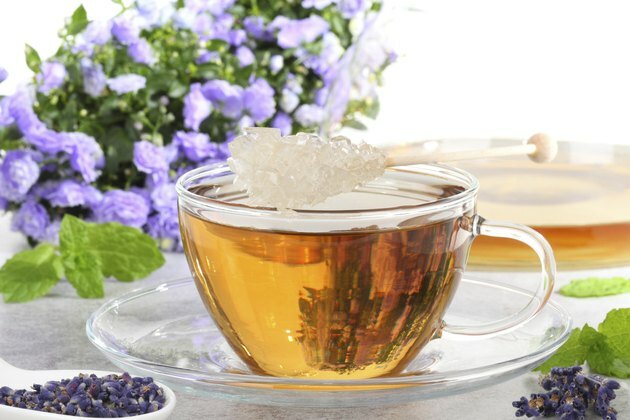 Lavender tea is relatively safe, according to MedlinePlus, but it can cause issues, particularly if you are taking medications that depress the central nervous system. Medications that might cause problems when taken with lavender tea include barbiturates, chloral hydrate and CNS depressants, often referred to as sedatives. If you have any type of allergic reaction, such as a rash or throat closure, discontinue use of lavender tea. Journal of Ethnopharmacology: Ethnopharmacological Evaluation of the Anticonvulsant, Sedative and Antispasmodic Activities of Lavandula Stoechas L.